Coach Barry Caron (center) and his New England kids may not be Yankee fans, but they adopt a Yankee motif in their uniforms and play style. The "Spirit of '76" lives on in these New Hampshire hearts, which bleed red, white and blue. 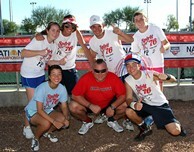 SURPRISE, Ariz. - One of the teams you can’t miss this week at the Jr Team Tennis National Championships is Coach Barry Caron and his Spirit of 76’ squad from representing the USTA New England Section. Competing in the 18 & Under Advanced Division, the red, white and blue-clad New Englanders have made an impression both on and off the court. "We use the name Spirit of 76’ to truly represent all of New England, and not just our state of New Hampshire. Our shirts say: ‘It all started here’ because we wanted to highlight that not only was tennis founded in our backyard, but so was our country. That’s why we wear red, white and blue - it’s American." It’s not just their personal style that echoes throughout the Spirit of 76’, it’s also their style of play. Coach Caron calls his teams approach – truly American. "We like to try and play a style where you don’t sit back. We grind, we make things happen. My approach is that we stay in the fight as long as we can, and when the opportunity is there, you take it to your opponent and force them to make a play." "Our style often takes people by surprise because you don’t see it anymore. We like to serve and volley and it’s hard to find a lot of teams who still play that brand of tennis." At first glance Coach Caron, and his signature Mohawk, looks like he should be a linebacker coach for the New England Patriots rather than a tennis coach, but to him it all fits within the story he and his team are trying to tell. "Right before we went to Sectionals, I went to get a haircut and I thought to myself, we are the Spirit of 76’ and what is the coach? The coach is the guide, and way back when, who guided the first settlers - the Mohawk Indians. "We won Sectionals with it, so I wouldn’t dare cut it off now." Coming from one of the smaller USTA sections, coach Barry Caron and his squad come to Nationals with something to prove. "You have to make your own history. The country did it in ‘76 - and we are trying to do it on the tennis court."